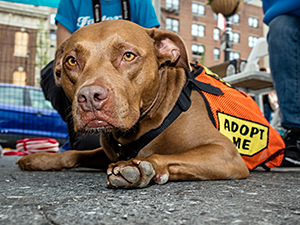 Several times each year since 2010, the Mayor's Alliance for NYC's Animals has proudly presented Adoptapalooza — our signature pet adoption extravaganza — in Union Square Park and other locations in Manhattan, Brooklyn, and Queens. These public events have featured wonderful cats, dogs, and rabbits for adoption from dozens of Alliance Participating Organizations. Each Adoptapalooza has also featured additional activities, including advice on pet care, training, and grooming; product giveaways; microchipping; dog licensing; pet photographers; dog performances; or other fun activities for the whole family — two- and four-legged alike. After finding homes for more than 17,000 animals at Adoptapalooza events over the past nine years, in 2019 we are passing the Adoptapalooza torch to Rock & Rawhide, an organization that we have worked with over the years to build the event into the tremendously successful pet adoption venue it has become. The Petco Foundation, whose generous sponsorship of the event has been critical to its success over the years, will again sponsor Adoptapalooza in 2019. Summertime Fun Time: Riis Park Beach Bazaar Is Back! LISTEN: Mayor's Alliance's Jane Hoffman on Adoptapalooza! President of Mayor's Alliance for NYC's Animals Talks Adoptapalooza & More! Meet Your New Best Friend at Adoptapalooza on September 7! Hundreds of Loving Pets Available for Adoption at Adoptapalooza! by Ken Foster, Out of the Cage! Adoptapalooza Returns to Washington Square Park on May 19! What To Do This Weekend: LIC Block Party, Adoptapalooza, Meatopia, And More! Pet Adoptions, Dog Agility & Family Fun on June 4 at Adoptapalooza! What's Fresh Around Town May 21st! Your perfect Saturday: Adoptapalooza, street dancing and "Mobile Uploads"
Calling All New Yorkers: Come Join Us at Adoptapalooza! Adoptapalooza in NYC this Sunday Sept 12th! Adoptapalooza this Sunday in NYC! Grab your Leashes! 'Adoptapalooza' is Back! Adoptapalooza 2: Raining Cats and Dogs!